I recently found a great set of posts about what a trolley is and how they work at Nathan Vass’ website. 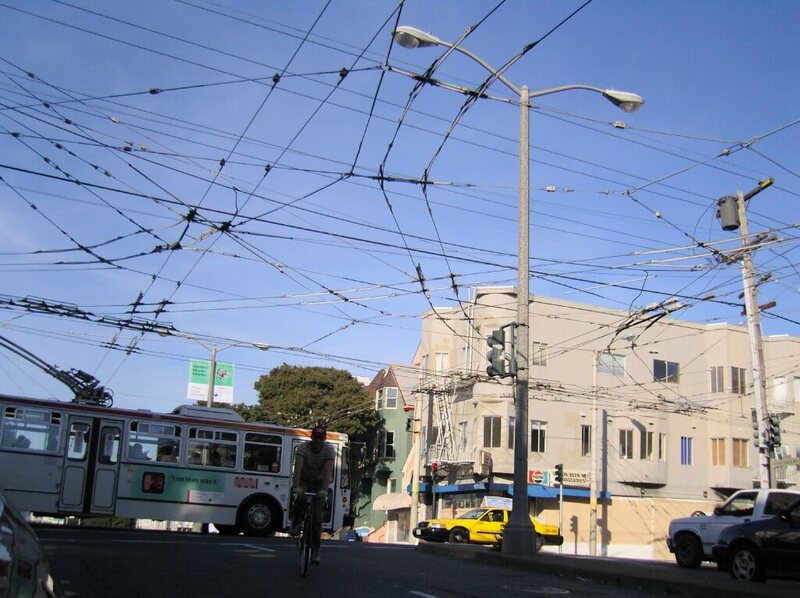 The short version is that a trolley is an electric bus that gets its power from overhead lines. There are many advantages to using a bus with rubber tires over a train (can change lanes, can avoid obstacles, climb hills without wheel-spin) and many advantages to using an electric bus over a diesel bus, the main reason being torque to climb the hills of San Francisco. I originally became interested in the topic last year when I visited San Francisco. There were many things I liked about the city that appealed to different interests of mine (city planning, green spaces, diverse cultures), but one of the things that stuck out to me was the infrastructure for the trolley system. This was not something I had expected. 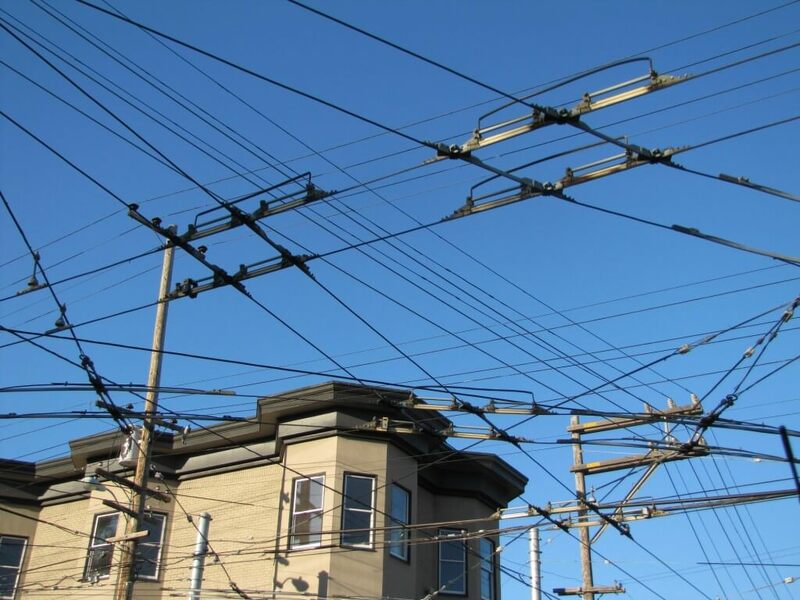 When you look up while downtown, just below the common sight of power lines at the top of the utility poles, you see what looks at first like a rats nest of electric wires. This is especially so around intersections in the road. But upon further examination, patterns emerge. I noticed that the wires were running in pairs of parallel tracks, and where one track crossed another, one of the pairs would have some extra hardware. I only spent a moment trying to figure out what they could be used for when one of the Muni buses (a trolley) passed me on the street. These are quiet, exhaust-smell free giants of public transportation that I was instantly in love with. And this post isn’t about public transportation overall, but if you need an explanation as to why it is good and how a bus can greatly reduce congestion, this GIF explains it beautifully.